Whom it may concern: Occupational Health and Safety training was conducted by SHEPPRO at our premises during the course of May 2018. Whilst Macsteel do have an internal Health and Safety department, I also wanted an external company to asses our compliance to health and safety regulations and ensure our staff are adequately trained. SHEPPRO assessed our policies and procedures and trained both our supervisors as well as our two team leaders. The training was conducted in a professional manner and all staff trained are in agreement that they benefitted from the training. 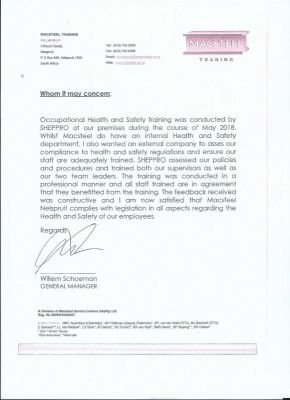 The feedback received was constructive and I am now satisfied that Macsteel Nelspruit complies with legislation in all aspects regarding the Health and Safety of our employees. 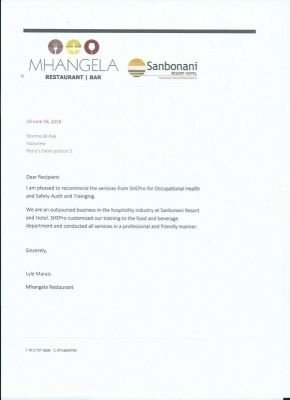 Sanbonani Resort and Hotel recommendation letter after a successful audit and training event conducted in June 2018.